Summary: no change in the Qatar vs. the four dispute. Tillerson getting nowhere. Some consequences in the real world; new e-book published today. We are pleased to announce today the publication of our completed new e-book “The Future of the Middle East”, edited by Hugh Miles and Alastair Newton. To download the free e-book for e-readers, including Kindle, or as a PDF please click here. We would like to thank once again all the experts who participated. A list of all the experts and their chapters can be found here on the Global Policy Journal website. The dispute between Qatar and “the four” (Saudi Arabia, UAE, Bahrain and Egypt), last considered in our posting of 11 September, shows no sign either of abating or of concluding. It is unusual in that neither side has significant external support, although there is a general feeling that the four are responsible for an unnecessary and potentially damaging affair, perhaps originating in an ill thought out initiative by the two young crown princes MBS and MBZ. Propaganda including fake news continues. The impact on the real world is so far limited but could become serious if there is no resolution. The Al Jazeera website has a useful running summary of material on the crisis as seen from the Qatari side, latest version at link. By contrast Rex Tillerson has been active. He visited the Gulf again this week, including both Saudi Arabia and Qatar yesterday. His main objectives have been to concentrate minds on IS and Iran, with the Qatar versus the four dispute an unwelcome distraction. Before the visit the State Department spokeswoman, asked whether he was more pessimistic about Qatar, said “We’ve seen… these kind of little skirmishes crop up between the countries before… I think the Secretary is certainly discouraged that nothing has been resolved just yet” She would not be drawn by a question about an interview with Bloomberg in which he had said that the block of four were responsible for the continued crisis because they refused to talk to Qatar. The propaganda war continues, and all reports have to be regarded with scepticism. A report by Brian Whitaker covers the attempt to promote the self-styled Qatar opposition at a conference in London, countered by “an apparently bogus PR firm with Qatari connections”. On 8 October the head of the Amir of Qatar’s court told the Spanish daily ABC that the UAE was plotting to invade with an army of mercenaries hired from a private security contractor linked with Blackwater but had failed to get a green light from Washington. A report by consultants Cornerstone Global of “an increasing political risk that Qatar may not host the World Cup in 2022” was picked up by the BBC, but Qatar has alleged that the authors had an “affiliation to the countries blockading Qatar”. Some effects are beginning to be felt in the region more widely. Reuters reports that the crisis is holding up the sale of the United Arab Shipping Company, owned by Qatar, Saudi Arabia and others, and the sale of Dubai-based United Arab Chemical Carriers, estimated value $200 million. A Financial Times report behind a pay wall is headed “Qatar crisis sends tremors through banking in the Gulf”. The Abu Dhabi-based The National quotes reports from Saudi and other Gulf media that the GCC summit due in Kuwait in December is likely to be postponed to mid 2018, and the US are opting out of some military exercises planned with GCC countries. 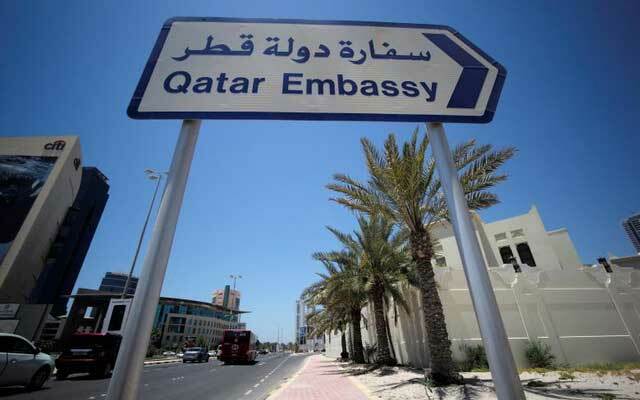 Qatar has taken formal steps in the World Trade Organisation to escalate a complaint it lodged in July against the UAE.